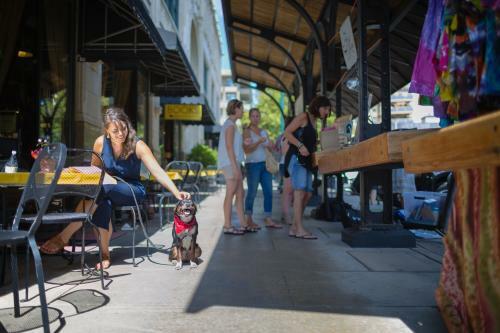 As one of the most pet-friendly cities in America, Asheville, North Carolina, is fun to explore with your best friend. We&apos;ve worked to make it even easier to navigate the city with your dog. Here are answers to frequently asked questions. Yes. In Asheville and Buncombe County, if your dog leaves your property, it must be on a leash. This law is designed to protect people and other dogs from unexpected and/or potentially dangerous interactions. Where are the nearest off-leash dog parks? There are two dog parks near downtown Asheville. 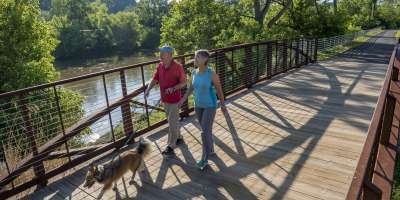 The French Broad River Park (580 Riverview Dr.) is one of Asheville most beautiful parks as it follows the contours of the river. The Dog Park features a large fenced-in area. The one-acre spot has wood chips, fresh water, and dog waste bags. The Azalea Dog Park (395 Azalea Rd.) is near the relatively new John B. Lewis Soccer Complex. There are two separate fenced areas, one for small dogs and one for large dogs. There is also a small dog park in Black Mountain at RiverWalk Park (205 N. Carolina 9). Are dogs allowed at festivals and events? In most cases, dogs are not allowed at downtown Asheville festivals. Due to crowds, weather and festival activities, most of these settings are not the best or safest situations for your pets. Please check with festival organizers before arriving to see if your pet is able to join you. Where can I buy dog treats, chews, and toys? Downtown Asheville features a number of doggie boutiques offering all the necessities for your pet. Three Dog Bakery (21 Battery Park Ave.) bakes fresh treats and premium dog food from the best ingredients. Find dog essentials at the The Dog Door (1 Battle Square) near the historic Grove Arcade. What can I do with my dog in Asheville? Here in Dog City USA the possibilities are endless for activities you can share with your dog! 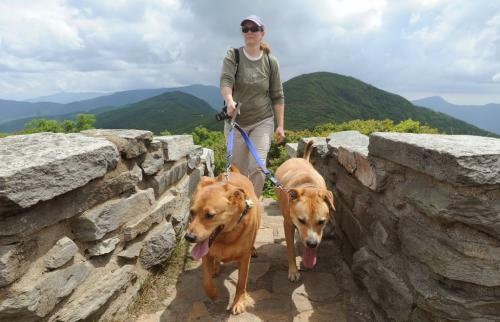 Most trails in the mountains make for dog-friendly hikes. 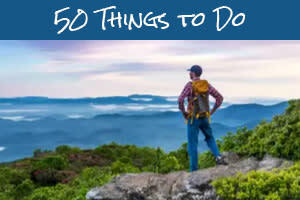 One of the very few exceptions is Great Smoky Mountains National Parks which does not allow dogs on its trails. You are able to bring your dog on the grounds of Biltmore (however, pets are not allowed in the home). There are many pet-friendly breweries and pet-friendly restaurants in Asheville. And, Asheville is home to some of the most pet-friendly hotels in the nation. Where can my dog have a play date? There are a number of places in Asheville that provide "doggie day care" where your dog will receive loving care and be closely monitored throughout the day. Among the choices are The Pet Vet on Patton (2 Hansel Ave.), The Dog House (1054 Riverside Dr.), At Play with Sparky (542 Short McDowell St.), You&apos;ll Work, I&apos;ll Play (677A Brevard Rd.) and Urban Dog Retreat (900 W. Chapel Rd.). All of these locations require that your dog be up-to-date on vaccinations (some have more specific or stricter policies) and most require a reservation or advance notice. What if my dog needs emergency medical care? R.E.A.C.H. of Asheville offers 24/7 emergency veterinary services, even on holidays. R.E.A.C.H. (677 Brevard Rd.) 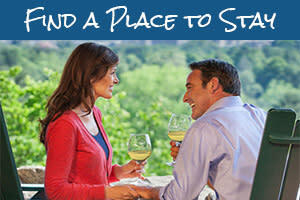 is just 10 minutes from downtown Asheville. The telephone number for R.E.A.C.H. is: (828) 665-4399. 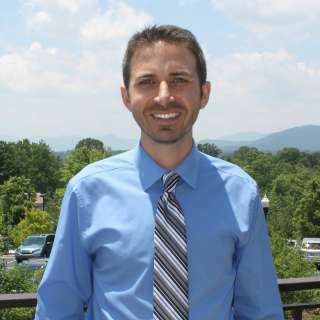 The Dog City USA Asheville Welcome Center (1 Battle Square) is the first of its kind in the United States and is a one-stop-resource to help dog owners to get the most out of their visit. The welcome center is in downtown Asheville and is housed in the The Dog Door and Behavior Center. The center features a doggy potty area, fresh water from doggie drinking fountains, free good dog bags, and doggie ice cream. Photo credits: Top photo by Emily Chaplin. Dogs at Craggy by John Fletcher Jr. Dog on patio by Nathan Chesky.